Having a Grinder Stand can make grinder easier and save space on the workbench. More shops in the old days had many of their tools mounted on their workbench. But, in today's working environment, it just isn't very practical or safe. Instead, workshops are setting up separate work areas or workstations with a clear area around things like drill presses, band saws, and bench grinders. By doing this, you have a more efficient workspace as you can maneuver your project from a Jig Table where the basic assembly takes place, where everything it is welded in place. Then you can do the touch up grinding there as well. However, cutting the parts and shaping them should be done on different machines and the final shaping is often done on a grinder to shape a part for an exact fit. So, if your workshop is set up in an assembly line fashion the work goes much smoother. If you implement KANBAN, Shingo, and JIT methodology, you can make a multi-person workshop run like a well-oiled machine. The bench grinder is a key element in any workshop DIY or pro. It shapes the metal and then smoothes it and polishes out all the rough spots. So, you need it easily accessible with plenty of free space around it for safety and ease of work. This is why people are now turning to work stands. HTC has an entire line of these helpers, and the only differences are the jigs, platforms, and the uses they are meant for. You can use such a stand in two forms one is the Pedestal with a central pylon and feet radiation out at the base. The second is a multi-legged platform that provides stability and support for the heavy weight of today's grinders. Today we are going to review 5 different variants of these Bench Grinder Stands, and from them, you can find the one that suits you best. Grinders today are lighter than in previous years. However, they are still heavy machines. If you are going to be using a pedestal stand, you will want to bolt it into the floor. Almost all the stands today have this provision. Others have a large proportion of their weight in the lower quarter of the bodies. You also should remember the use of a bench grinder entails a great deal of forward pressure and you do not want to be following the grinder around the workshop. People’s heights vary as well as they nowadays like to sit while working. So, if possible get a stand that can adjust to a comfortable height for the work you are doing. But, you also need to have a secure locking system that will hold your grinder at the height you have chosen. In order to securely mount your grinder to the stand, it is best to have a combination of slots and holes that allow your stand to support your model of grinder and to lock it into place. You also want a mounting plate that is thick enough not to warp under the weight of your grinder. Along with the ability to hold the weight of your grinder, keep the weight low, and you need to have legs that when tightened keep everything on an even keel. This means that when you have assembled your stand the legs needed to be either adjustable or when you have tighten them properly the mounting plate is horizontal when you are finished. Before buying any bench grinder stand. Go online and look it up. Ignore the high rated reviews and look at the lower ranked reviews first. Then peruse the positives. Pay attention to assembly, quality, and workmanship. You can see by the wording that the reviewer actually knows about the item and is balanced in their opinion, giving you positives and negatives as well. Look for reoccurring themes and patterns of speech. Keep these thoughts in mind, and you will be able to pick a grinder stand that will suit your needs. Now let’s take a look at our choices for Best Bench Grinder Stands for 2017. If you want an inexpensive bench grinder pedestal, this is the way to go. You have a 9.9" X 12.4" steel mounting plate, and it will handle various configurations of bolt alignments. When it's all put together, it is 31.5 inches tall, and it includes a water tray that helps you cool things off a bit. Look toward WEN and their 4288 Cast Iron Grinder bench stand, when you need a grinding position for your DIY workshop or small business. It is heavy enough to hold most grinders steady in place without wobbling. ● Finally, Amazon got their wording straight in the advert and now gives the correct info as to which WEN grinders it will match up with. ● It is not the most expensive bench grinder pedestal stand, and that puts in the range of most DIY workshops. ● However, the grinder mounting plate is sheet metal thought is sturdy enough for most applications. The Pitt Bull lives up to its name for stubborn ruggedness and wouldn't give up. This is what you will find when you are, searching keywords on Google like "buy bench grinder stand." 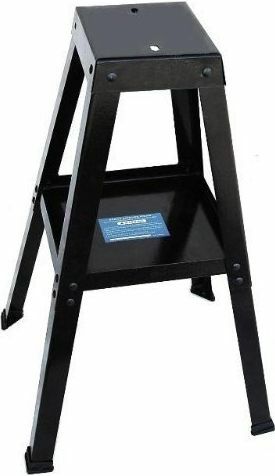 The MOKOTO Corp brings this bench grinder stand to you. They know that you want a platform that has a tool tray with four solid legs that support almost all models of grinders. Along with most sanders, you can find out on the market today. It has a solid steel mounting plate that measures 7-7/8" x 8 3/4". 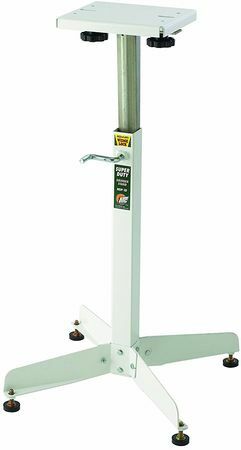 With this grinder stand in your shop or garage, grind metal becomes a simple task no matter what kind of grinder you have or are planning to buy. This is an ok stand, which will handle many of the grinders out there. It looks like to be a copy of one of the larger maker's grinder stands. The cooling tank is integrated with a tool tray that mounts to the pedestal mount and is height adjustable. If you follow the directions online from the other owners in drilling your own holes and a few other modifications, you have a solid platform for a pedestal bench grinder. The mounting plate will handle a wide variety of Bench Grinders, Not only JET but DEWALT as well as others. It has mounting possibilities for other bench tools besides just grinders. I have a belt sander as well as a drill press on one of these pedestals. Once you get past the problems with the mounting hardware. You have a platform that can be bolted solidly to your concrete floor through the three bolt holes in the floor base. Even without them is has a wide base which keeps things steady as a rock. ● The shipping container is the biggest problem. It is not strong enough to hold all this metal and make it to its destination unscathed. ● Don't use their mounting hardware. Drill out the holes and use boles from the inside out instead of the way they recommend. Do that, and you will have a bench grinder pedestal that is worth its salt. The reviewer knows JET products and they are some of the best out there. This stand is not up to their usual standard. But, when you look beyond that and substitute your mounting hardware, you have a good solid base for your bench grinder. So, it might be a little extra work in the beginning. However, if you look at the reviews online the owners are for the most part 65% still give it 5 Stars. The reviewer knows his way around a shop since high school and is aware that to get things to work in a shop you need to modify things to get the job done. Working later on a Nuclear Submarine, we learned to make what we needed from almost nothing. Doing the impossible with nothing became the mantra that allowed the Submarine Service to carry the fight to Japan in WW II and this idea is still very much alive both there and in real workshops all over America, in garages, and in the Amish communities. So, if something doesn’t fit right. An American Improvises, Adapts, and Overcomes. This product has some rough edges. However, it can be a solid piece of shop gear with just a little work. The price of the iron alone makes it worthwhile to do. Get that bench grinder of the bench is the wave of the DIYer these days. Bench space is at a premium in this world of small size workshops. It costs too much to waste space. So having a Bench Grinder on a pedestal only makes perfect sense. A pedestal grinder takes up less space, and you can work at the right height. The Grizzly has three feet jutting off its pedestal base that can be bolt mounted to a concrete floor. The Grizzly helps you have a pedestal bench grinder at a bargain price. Though some are of the opinion that it is top heavy, it is designed to be bolted to the floor. So, if you have a heavy grinder, it behooves you to lock everything down before using. The construction quality is superb, and at this price, it's a steal. How would you like a fully adjustable bench grinder stand? One that goes from 25" to 41" and can hold up to 500 pounds of grinder? Well, look no further as HTC has the one you want. The HGP-10 does that and more. It has a wedge lock that has an inner sleeve that locks the platform at the height you desire. King Kong would find it impossible to budge it once set. It also has 4 splayed legs that allow for individual leveling. You need to do some upfront work first. The feet need to have their bolts cleaned of paint and flash. You also need to be careful not to over torque them. Made in China, however, it was better quality than expected and HTC uses this basic design on over 10 other products and just changes out the platform at the top. It pops together in under a half hour and if you put it together first without tightening the bolts. Then level it by tightening everything a little at a time. It will go together aligned and without distortion. 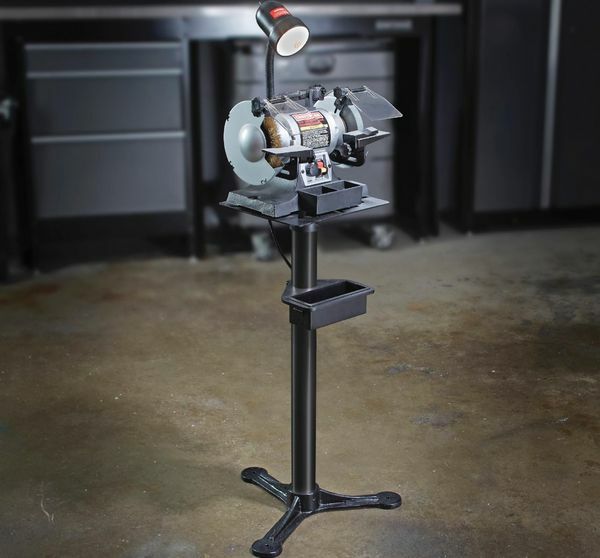 Today, you have not only looked at 5 of the best Bench Grinder Stands. You now know what to look for to ensure you are getting your money's worth. Bench grinders are key elements in a workshop today. Even in the new and evolving world of 3D printing. Bench grinders are needed to shape composites, plastics, and the metal alloys that will soon be the mainstay of technology in the future. However, even the traditional methods of fabrication still in use have put new demands on the grinders of today. They have changed to adapt to this brave new world. New alloys and materials make them lighter than before. However, while they have gotten lighter but they still require a sturdy platform to support them. The stands we've highlighted for you today all have this characteristic. Along with that, they all exhibit the ability to mount a wide variety of grinders. Even those designed for a particular company's products will also support a wide variety of other parties’ products (OPPs) as well.